There are few publishing houses which can make one feel enchanted, and they don’t come along very often. (I’ve ‘met’ two others in my lifetime.) To create such a mystery requires foresight and intent, yet to understand this, what is one to do? To be enchanted by a catalog, there is no better choice than Biblioteca Adelphi. Eclectic, erudite, expansive—each book explores the great questions of humankind—Who am I? Why am I here? What does it mean to be human? What is my purpose? How did the world come to be? What does it mean to have a god? Is there a god? As well, smaller questions—Should I hate my father? Why is the world trying to kill me? What are other cultures like? Whom do I love? Shelves of Biblioteca Adelphi editions—sadly not (yet) mine. I find the array beautiful. The majority of books in the series were published in translation to Italian; of the 653 books published to date, only a few over 100 were originally written in Italian. Many of these books were first introduced to Italy by Adelphi. There are over 30 source languages. It is an incredible legacy and a fascinating series of choices, an expression and choice of a culture, perhaps the creation of a canon. I decided I would read all the books, in order, as many as possible in the original language, some, also in Italian. 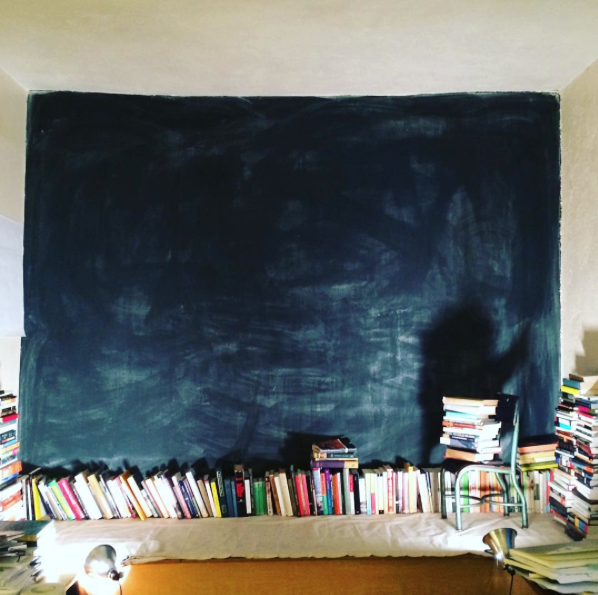 Curing the chalkboard wall I created in my studio, to map the ideas and histories of the project. It is, perhaps, a type of madness, to read 653 books in the order in which the publisher chose to publish them. However, I am certain there is something in the experience, in the act, something perhaps greater than the sum of the parts. It can be seen as a list or a map, as a palimpsest, a mosaic, or a magic spell. It may be a zone of the unknown whose enchantment can be felt only by entering. It is certainly a particular view into the mysteries of life, across time, across place, across culture. There is something so compelling, to the books and to their collection. I look at them on the shelf, in order, in my studio, and marvel at who sits next to whom. One small slice. 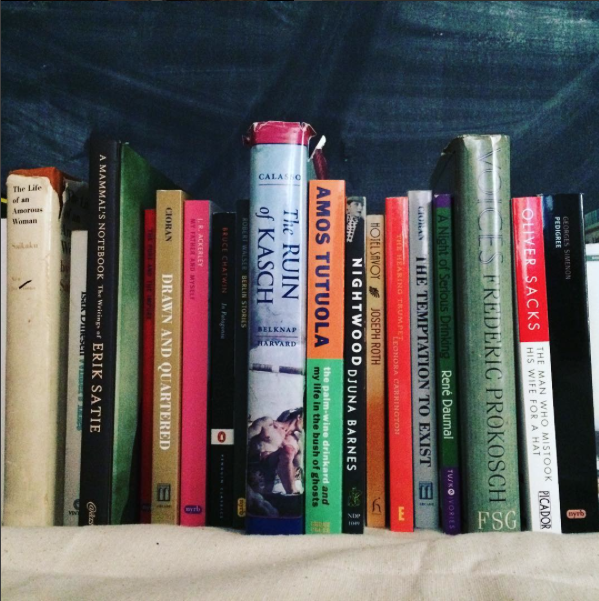 Tutuola and Roth, Cioran and Daumal. Simenon and Satie. The Adelphi Edizioni was started in 1962, with the first of Biblioteca Adelphi series published in 1965. These books come from an amazing array of genres including literature, philosophy, science, poetry, science fiction, religious texts, travel literature and mysteries. In 1965 Biblioteca Adelphi’s first release was The Other Side, by an Austrian author, Alfred Kubin. A strange sci-fi novel, at once dystopian and utopian, it is an interesting stake for the first of the ‘good’ and ‘singular’ books. From there 1965 rounds out with three authors: Edmund Gosse (British biography), Jan Potocki (a Polish Count who wrote a surrealist Spanish adventure story, in French) and Antonin Artaud (French diary of a mystical drug trip in Mexico). It is a curious start and it gets even more curious from there. Calasso discusses the philosophy behind the house in his short collection of essays, The Art of the Publisher, the ideals of Bazlen and Foà and Olivetti, the founders. It was this book that spurred me to ask what I would learn, what it would be like, to go back to the beginning of Adelphi and read all the books in order. One night, I stayed up late and translated the catalog. I pulled all the records in Italian, and added two additional languages: English, and the original language the book was written in. The next day I began haunting the used book stores of New York City to find the books I needed. And thus began The Adelphi Project. 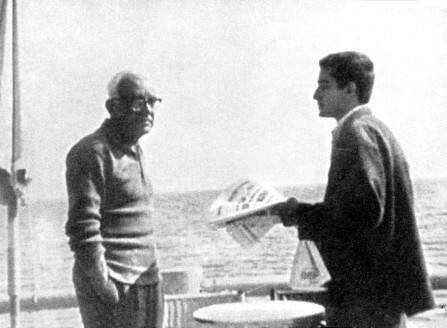 Bazlen and Calasso, long ago. I began to read the books in order and quickly realized I needed additional context. I needed to understand the context of each book—when and where it was written, why, what could have been the ‘singular’ experience that inspired its creation; I needed to understand the history of Italy and how these books were published when they were, starting in the 1960s, a time of upheaval, the country barely 100 years old. I needed the histories of the authors, the places where the books were written, the time periods, the friendships, and the connections. ; and I needed to better understand Calasso himself. In order to understand Calasso, I needed to go back to the classic Vedic texts, the Rigveda, and Sanskrit, a language that creates a shape for the languages that follow. 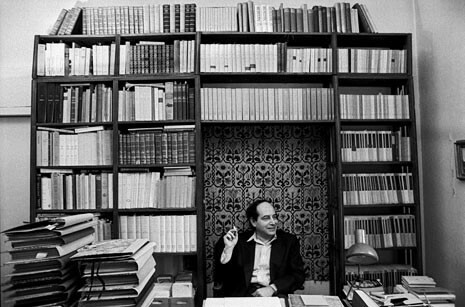 Calasso surrounded by books, as we all wish to be! 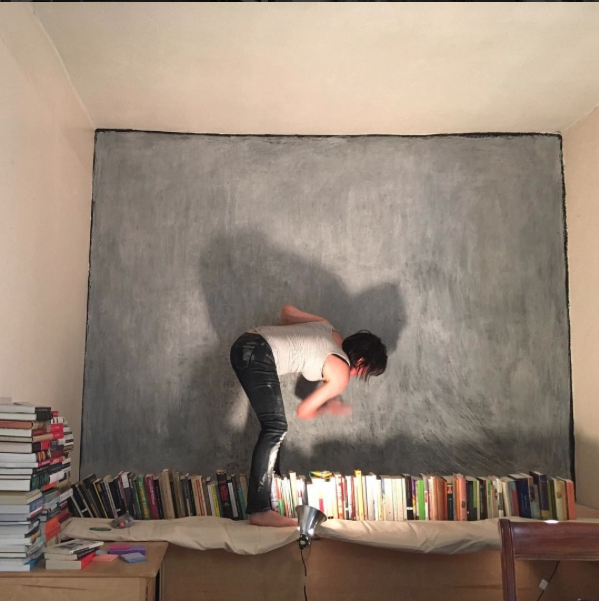 73 books in (and with an additional 128 non-catalog books, read for context), I begin to see the shape of the shadow which is cast by this Biblioteca Adelphi. I think it is more a mosaic than a map. But it is early yet, and I’m not looking for a plot, so much as a cosmology, a mythology, some combinatorial chaos which writes a meaning of life, one, many, the mind seeking a high order of consciousness, through that which it experiences itself, and through the experiences of others. I began with no idea of what the output would be, and as I work, I find it is myriad. It has a daily instagram and tumblr diary of what I read and what I learn. I am writing essays about the strange connections across time and place, about topics that got lost, about the different meanings I can find in the project, the people, the house, and Calasso. I am creating a series of short films. Some of these books seem to have never been translated into English. I need to do this. A new morning and the wall is cleared. I begin again. Across the bottom are the catalog books, to the left are histories of Italy and Vedic/Sanskrit materials. The right holds histories of modernism, and biographies and letters of connected artists. There are history stacks of countries, notably Austria and Germany, where many of the books originated. In some ways, it eats everything it comes across and transforms it, my life, my ideas, the conversations I have with others, the books I read. The ideal is that it transforms and illuminates, that it pulls from the past to light the future, that it reminds us of the things we haven’t recently looked at, be it literature we no longer read, or truths we forget to ponder.